The apple trees in my back yard. I live in an area that to me seems mystical, or magical. 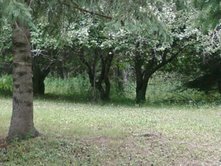 Many strange and wonderfull things have happened since I moved out to this spot, some involving animals, some involving spirits. Was this part of my path to move here? And what is my path? I used to ask that question at certain points in my life, especially when something tragic would happen, or paranormal, or a near miss would make me question things. Were those events put in place to make me question myself? Sometimes it appears that way. Roughly 5 years ago I started to feel that my life in radio was not really what I was here to do. Now I really feel that way. Instead, I am being drawn to pursue what was just a fun hobby at first, my podcasting on the internet for the Out There program. I have learned so much in 5 years, thank you to all the wonderfull people and spirits who have shared openly. So now I kind of know that I came here (I believe by choice) to help infuse the world with new options for understanding in changing times. I've been told that by some psychics who I've interviewed and it makes sense since it is my true passion. So what makes me so special? Nothing, I am just like you. I just kept taking steps, almost like I was led to this. Perhaps you are sitting here reading this and wondering what your path is. How do you take the next step? It seems to happen when we are ready, I think you can trace your advancements. I can look back on my life and see all the things that led me to where I am. 3 months before graduating high school, with no direction or idea of what I would do, my buddy talks me into checking out a broadcasting school in Wausau Wisconsin. I get my first radio job in 1979. After getting fired from that job and only finding part time work I was almost talked into giving up radio completely by my first wife, when out of the blue a radio station in Vicksburgh Mississippi calls me with an offer. It had been a full month since I had applied with them. While down in Vicksburgh I am exposed to the Civil War with their incredible park. At the time I could care less but a friend keeps dragging me to see it. Eventually something would ring inside me to make me really connected to the Civil War, and even feel like I lived in that time period. In 1985 I start looking to leave radio in Mississippi and plan on moving on to bigger and better things. I apply all over the country and 2 promising leads, one from Tulsa and one from Lincoln, come my way. A third offer is from a small town radio station in Escanaba Michigan. I had no intention of moving back to a small market but the same guy (Lonnie) who convinced me to go into radio, made me realize I could move back closer to my son and family, so I did. Without a doubt the best move I could have possibly made regarding how connected I am to nature and being there for family. Roughly 6 years another friend (John) told me I should do my own talk show, I didn't care for talk radio. I had always been a radio "jock" on a top 40 station and that's what I liked. Funny how that changed and funny how it's now very clear why that changed. My whole life has been about having unusual and paranormal events. I've spent the last 30 years collecting bizare stories from others, at the time I was just curious. Now it makes sense why I was doing that. Back then you didn't publicly talk about these topics, now it had become more widely accepted and I find many who are starting to speak up without fear. That is why I do this show. Can you look back on your life and see connections? What really interests you? What really makes you happy? Perhaps that is where you need to go. What if there was a plan put in place before you came here and you just had to connect the dots? Why does that have to happen? I don't know, I would rather just take the easy route but it never seems to work that way. Too many questions? Any of it make sense? Somewhere in the 70's I went to see the Legend of Billy Jack. The movie hits me in a way that I can't describe. It connects me to Native Americans. Years later I am told that I lived as a native many times. My most recent was in the late 1700's, I knew that before I was even told that. Sound crazy? No show this week, my podcast site must have had too much for Thanksgiving, it is full. Burp. No room on my site for a show. I will have a new show next week it all goes well. I have noticed that many of the events I attend regarding metaphysical are mostly women, now why is that? So what is metaphysical? I define it as what exists outside of our physical realm which is now starting to become part of this world. I also see it as a series of ancient natural practices which can help me find answers, for I believe this has been around for a long time. It seems that we are entering a time when more Goddess/Feminine energy is emerging on the planet. For years this planet has been ruled by masculine energies, what have we gotten? Many would blame men for wars and famine and whatever else is wrong with the planet. What I've observed is the unbalanced male ego, I used to let it rule me. It doesn't like to admit it is wrong, it doesn't want to back down, it thinks it has all of the answers, it doesn't want to show emotions, it can lead towards aggression. Now when balanced the name Solomon comes to mind. Does that sound true in any way? I just think we are out of balance, it just seems so obvious in our society, men acting more like women and women more like men. I just think those people are just trying to teach us balance. We need both energies, we are both energies. I believe we have been out of balance for a very long time, but what it there once was a time when the Goddess Energies were dominant on this planet? There would have been a time when my male ego would have not accepted that idea. Now, it seems pretty obvious that we need to return and embrace these energies, even us manly men, ugh! Actually I'm a pretty sensitive guy and in touch with both energies, yet for years I pushed away the the Goddess Energies. Why? Because other guys would have thought I was soft, or a wimp or whatever. Now, I don't care and I know that I am not soft. I merely can feel, but that does not make me weak for I have probably been in both types of bodies. Some of you may find that last statement a bit nutty. I believe when we are outside of are body we are both energies. Someone once told me that there was a time when women were the rulers of this planet, and they ruled with fairness and compassion. A plot was put in motion to remove them from their power and to degrade them. Why? Control, it's always about control. Control is not of the light, and I'll just leave it at that. 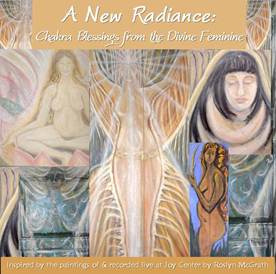 This week Roslyn McGrath channels the Goddess Energies. So, again, I don't even know what to expect, but you know what? I was pleasantly surprised. You will hear from Aphrodite and Isis. Isis was some kind of powerfull Egyptian Goddess, am I to worship her? No, that will never happen, but like usual when dealing with Roslyn it always about a higher more unconditional love. That's the recurring message that I keep hearing over and over, my male ego can't argue with that. Thanks to Roslyn for approaching a subject that some will see as a bit out there. In 1970 Bruce Gernon, his father, and a business partner were returning home in his Beechcraft Bonanza A36 from Andros Island to Miami. After waiting for inclement weather to pass the trio set out on what appeared to be a pretty good day for flying, until they encountered what Bruce terms a time storm. While in this storm the trio entered a perfect tunnel that surrounded the plane, and there was an electronic fog that appeared to attach itself to the plane. Upon leaving the tunnel it is estimated that Bruce's plane traveled 90 miles in about 3 minutes, an estimated speed of 2000 mph!! His plane at top speed could maybe do 200 mph, so how did this happen? Furthermore, how did his plane not break apart? Also, how does a perfect tunnel form inside of a cloud? Why would a cloud appear to attach to your plane? As if turns out Bruce is not the only person to report about electronic fog, a few others have had similar encounters. In this interview Bruce speaks of a family that wrote to him about their grandfathers experience....who claimed he entered one of these clouds and went back in time by one day! Bruce has appeared on many tv and radio shows talking about this event that changed his life forever and put him on a mission to prove what he experienced is real. So how can you prove it? Fortunately Bruce has sparked the interest of several people. One of them is a professor from the University of Nebraska named Dave Pares. Early next year Professor Pares will be working with Bruce to recreate an experiment regarding electonic fog. The professor believes that he may actually be able to create a smaller version of a time/space warp. Possible? Have you heard stories about the Bermuda Triangle or other places on the planet where strange events seem to happen? Some even say there is a Great Lakes Triangle. Is this phenomena created naturally? Could our government, or world governments be involved? Is it ufo's? I know that's probably not the popular answer but I think back to an interview I did with David Twitchell (who lives near Detroit) who claimed in 1962 his whole family witnessed the sky open and large unknown craft hover over south Detroit. Are those 2 events even connected? Did you ever see the movie The Philadelphia Experiment where they try to create a time/space warp. There are some within the military who claim that may have actually happened, we attempted to bend time and the results weren't so good. What do you think could cause this? Feel free to post a comment. My own theory? I believe there are doorways on this planet that were created by advanced races that they use from time to time to come and go as they please. Too many, in my opinion, have witnessed ufo's in these triangle areas. Crazy? Maybe. Joy Regina Melchezidek always lived in a world where the supernatural was the norm. Her earliest memories of communicating telepathically with spirits occurred before she could talk. By 3 years of age she was tuning into souls and doing healing work. 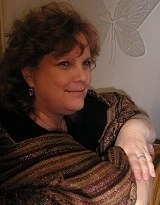 After meeting Flo Aeveia Magdalena in 1991, she was trained in a multitude of Shamanic studies. Joy’s work expanded and now includes the Heart Thread work, the Soul Recognition process, and the Circuitry Alignment process. She is a teacher, a writer, and an advocate for children and peace. Joy’s psychic detective work has led her to working with the police and others to solve missing person cases. She has also taught high school forensic classes how to utilize their intuition to assist in solving crimes. Known as the “Baby Whisperer’ Joy serves as an advocate for children and peace. She is the founder and executive director of “tee-shirts for peace.” Under the umbrella of Soul Support Systems, “tee shirts for peace” is focused on the holistic care of children, as well offering resolutions to effectively stop violence for everyone. When I talked to Joy a couple of weeks ago she blew me away with what she had to tell me about myself. Not only was it accurate but some of it has been my own private thoughts that I've shared with almost no one. She accurately described both of my parents and their roles in my life, even after they have passed. She told me about my interaction and how I was connected to "others" not from this planet. Finally she told me I was protected, she claimed she saw the archangel Michael around me, which is so true because I have asked him to be near me. This week I will have a couple of guests in the studio to see if Joy can read anything for them and assist them. I have talked to many who can see and hear things but this was by far the most impressive detailed reading I have ever had. Joy can also be reached on Facebook. Hate your job? Think you got it really bad? Maybe it's just perspective. I've known Tom Ranguette from Garden Michigan for a few years now, he reminds me of people I used to know as a kid growing up. People who worked hard to do whatever it takes to provide for their family. People who are down to Earth and don't take a lot for granted. Every year for 2 months Tom and one of his sons will head to Cook Inlet Alaska and join several other fisherman trying to make their catch and make enough money for the season to feed their families. When Tom returns he brings me some of the freshest most incredible salmon and I always put him on the radio and on my podcast. In this show we talk about how difficult it can be to do what Tom does yet there are some really cool things that Tom shares regarding his attitude and why over 9 years others have their boats break down and his hasn't. Tom believes you have to treat your vessel like it's a living thing. You hear that from time to time, it only makes sense that there is spirit/energy in all things. Tom also shares with me how he's helped others who needed to be towed and how he received a bounty shortly after. It's like he could do no wrong and the fish kept filling his nets. Could that be considered good karma? 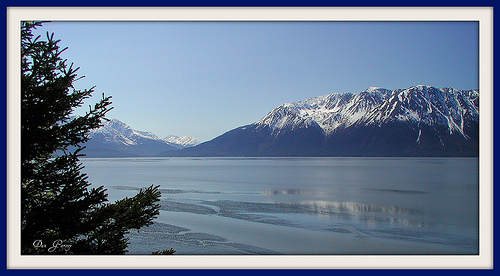 What is it that appeals to so many about rugged Alaska? Tom told me it was in the 50's in June when he got there and told a clerk it was a little chilly, her response "Oh, you're not from around here." Or he would tell me how the locals would complain that it was too hot and they would be glad when the cooler weather comes. Recently I saw a show called Dual Survivor and the one guy was wearing shorts and was barefoot in Nova Scotia with snow on the ground. He said he's been living like that for over 20 years and his body has adapted. It really is evidence of how amazing our minds and bodies were designed to survive in all different types of climates. I've always wondered how humans survived before fire, perhaps they didn't need it? If you're ever at the U.P. State Fair make sure to check out Tom's Fish House. Tom uses only the freshest whitefish caught right out of Lake Michigan that same day. He doesn't have to do things that way but he knows that once you've tried something really fresh you will realize the difference compared to something you may find at a supermarket. While this show doesn't deal with my normal topics of strangeness it does have a similar feel and that's regarding how it's all connected and when we respect and honor our surroundings we will receive abundance, or so we both believe. Also Tom shares with me a really incredible experience that led him to help his sister in law with a product called Essiac Tea. Have you heard of this before? It seems to work pretty well for many, not all, with certain types of cancer.